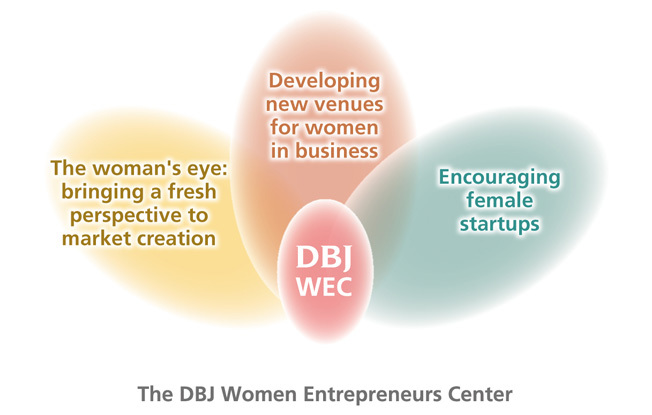 The Women Entrepreneurs Center (DBJ-WEC)｜Development Bank of Japan Inc. Registration for the 5th DBJ Women Entrepreneurs New Business Plan Competition has closed. Registration for the 4th DBJ Women Entrepreneurs New Business Plan Competition has closed. The 4th New Business Plan Competition for Women Entrepreneurs launched on December 15,2014. Registration for the 3rd DBJ Women Entrepreneurs New Business Plan Competition has closed. The 3rd New Business Plan Competition for Women Entrepreneurs launched on December 16,2013. Resistration for the 2nd DBJ Women Entrepreneurs New Business Plan Competition has closed. The project of Women's \10M Entrepreneurship Competition was on air and featured on Close-Up Gendai, a famous NHK program on Wednesday, July 11, 2012. The entire selection process of the competition was completed. Winners will be announced on Tuesday, June 19, 2012. Call for the Executive Summary & the Business Plan was closed. The application was closed. Submission deadline of Executive Summary and Business Plan is 5:00 p.m., March 14 (Wednesday), 2012. Woman power will change the Japanese economy. With a shrinking workforce caused by a stagnating economy and an ageing population, compounded by the many challenges of rebuilding from the 3.11 2011 disaster, Japan is increasingly looking to its most underused resource: women. Women entrepreneurs with new perspectives can be the driving force behind Japan’s renewed growth, bringing needed change to the economy and society as a whole. In November 2011, DBJ launched the DBJ-WEC to support women in their efforts to establish new businesses. Motivated women entrepreneurs will be able to obtain comprehensive support in areas including funding, and start-up expertise.